Dear Owen, I am currently doing research and compiling data in order to draft a proposal here in Canada largely related to solving an epidemic within our First Nations communities in regards to a lack of adequate housing. I could go on for hours and hours about the immense and serious problems in this area, but I’ll keep it as brief as possible. Many of these areas are in arctic or subarctic conditions and I am curious if there is any data available on the viable use of earthbag building in such areas. I am certain that this should be possible especially given that a majority of families in the most remote areas live in temporary housing with little or no insulation, and thin walls. My first thought when trying to come up with a solution to this problem was earthbags due to their sustainable nature, low cost and widely available materials. Many of these reservations have absolutely no sources of income or employment and survive entirely on government assistance so cost effective solutions are incredibly important while having to be as close to permanent as possible. Though I am nothing more than a humble artist, recent events in our country have given me a strong passion to work towards this cause. 2. You’ll definitely want to create a passive solar design with lots of large, south facing windows to maximize free heat from the sun. Thick, high mass walls and floor will absorb the heat, and a thick layer of insulation around all sides (including under the floor and on the roof) will trap the heat inside. You could even grow bananas or other tropical fruit with this sort of design. Note to other designers: I’d like to refine this design with input from other design professionals and make all drawings freely available on the Internet. Please email me at strawhouses [at] yahoo.com if you would like to contribute. Owen, have you considered splitting up the bathtub, toilet, and vanity into separate, smaller rooms? Typically if somebody is taking a shower, the water heater output and water pressure will be too low for somebody else to take a shower. Families tend to have bathroom sharing problems because all of these elements are packed into one room. Someone needs to take a shower. Somebody else needs to do her makeup. Another needs to use the toilet. This might alleviate the need for a secondary bathroom. Another thing to consider is that sleeping problems can happen if you use your bedroom for anything other than sleeping. 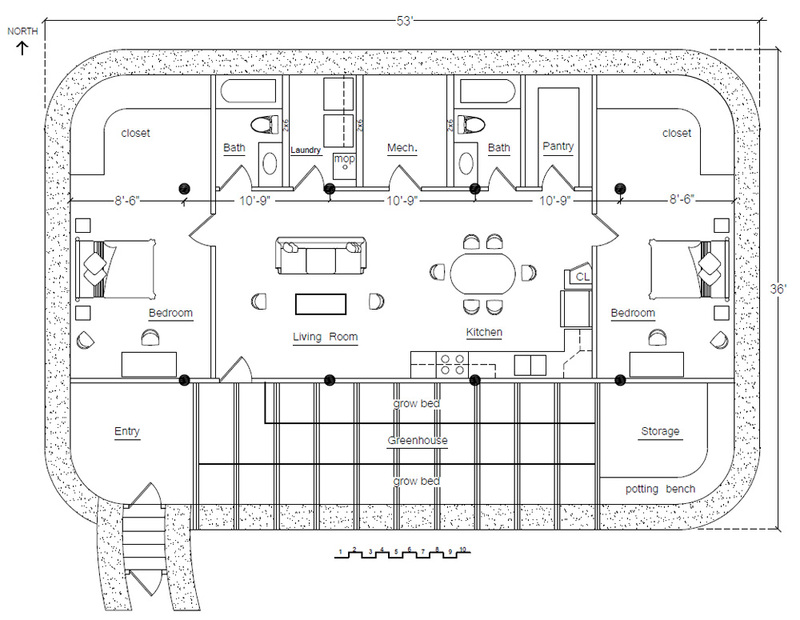 Perhaps it could be split up so there is personal study/den and a small bedroom instead of a big bedroom. Thanks for the input. These ideas are worth considering. Ultimately it will be up to the families to decide on the final design. One complication is many of these people have large, extended families who will live together. At some point, we’ll have to bend some typical design principles. The Earthship community have been looking at Nordic climates too. They have the idea to have a double green house on the south facing wall. This will make it loose less heat back out that way. Thanks for tip. I hadn’t heard that. HI! Can you tel me in what procent I can use scoria in one bag? It is posible to use straw inside the bag for the insulation? This may require some temporary bracing, tying courses together with twine, buttresses, etc. to ensure the stability. Bond beams, lofts, pinning, etc. all add strength. Once everything is plastered then it’s very strong. It’s better not to use things like straw that can rot and compress.